Mandates that DMHC and CDI conduct an annual public meeting regarding large group rate changes. SB 546 is among the most comprehensive state statutes in the U.S. to require such disclosure in the large group health insurance market. The California Labor Federation, UNITE HERE, and the Teamsters sponsored the bill because many union trust funds and employers have been experiencing seemingly inexplicable and significant year-over-year rate increases in the market for employer-sponsored health insurance. Since 2002, health insurance premiums in California have increased 216% – almost six times the rate of inflation. 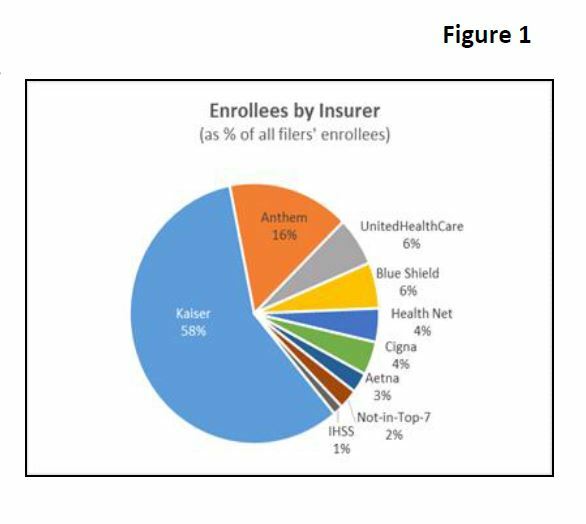 This document analyzes the first year of filings made pursuant to SB 546 for reporting year 2016, focusing on California’s seven largest filers (by number of covered lives) in the fully-insured large group market: Kaiser, Anthem Blue Cross, UnitedHealthcare, Blue Shield of California, Health Net, Cigna, and Aetna (“Top 7”). Unless otherwise noted, all data comes from the SB 546 filings. 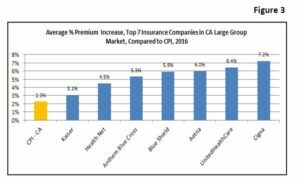 Premiums: The average premium for CA’s large group market in 2016 was $438 per member/per month (PMPM); the average increase was 4.1%. Premiums ranged from $122 to $711. Changes in rates ranged from -2.9% to 9.9%. 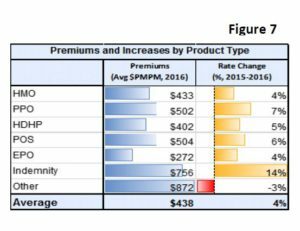 Among the Top 7, average premiums ranged from $396 to $484 PMPM with an average of $439 and an average increase of 4.2%. 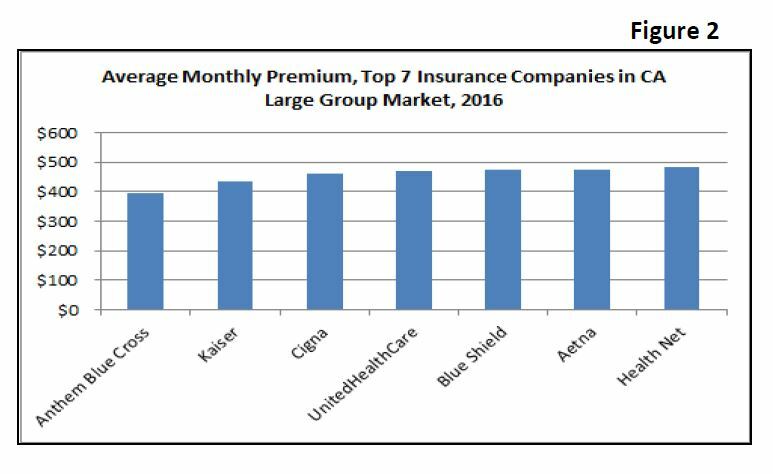 (See Figure 2 for average monthly premiums, across all large-group products, by company.) 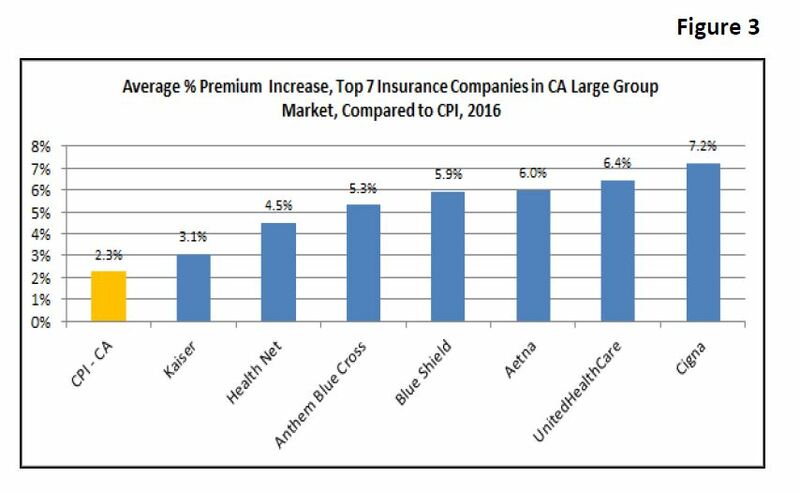 Per Figure 3, average premium increases for each of the Top 7 exceeded California’s inflation rate (CPI). These average figures obscure the range of premium costs as workers experience them. A group’s rate may differ from the average because groups choose different products (e.g., HMO, PPO) and different amounts of coverage, and vary in group characteristics that are used to predict their health cost (e.g., age, geographic area, past health care costs). Insurers choose how to price the products, and decide on the type of coverage offered. Insurers and groups negotiate the premiums. The average premium here is not the “self-only” or “single” rate. Rather, it reflects the total premiums collected by an HMO or insurer divided by the total number of covered lives. Employer plan sponsors choose the number and types of tiers (e.g., self-only, Employee+1, Family, etc. ), and in some cases, the conversion into tiered rates. 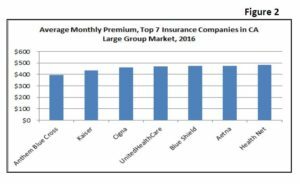 Actual premiums vary significantly and depend on a number of factors, including level of coverage; type of product (e.g., HMO vs. PPO); the group’s health risk experience; and the insurer’s method of rating the group. 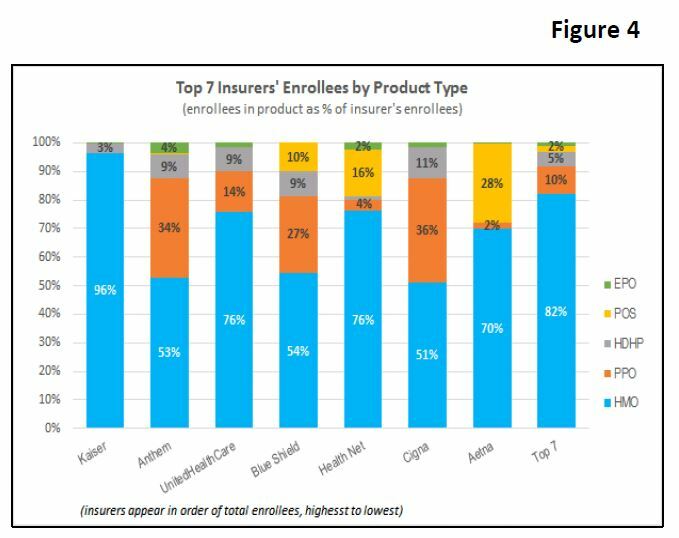 Of the Top 7 companies, Kaiser had 96% of its enrollees in HMO products, the highest share in HMOs of the top seven, and nearly 0% in PPOs. 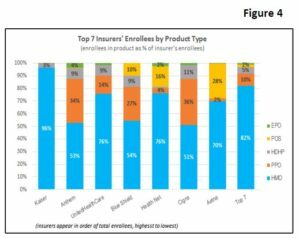 Cigna had the highest PPO enrollment (36% of its enrollees), the highest HDHP enrollment (11% of its enrollees), and the lowest HMO enrollment (51% of its enrollees). Some filers noted that they had included some or all HDHP enrollees in other product types (e.g., an HMO product that also has a high deductible was counted in HMO and not as an HDHP). Others did not explain how they counted enrollees with HDHPs. High deductibles may cause patients to forgo or delay needed care for fear of the high out-of-pocket costs – in 2015, 31% of all Americans put off some sort of medical treatment because of cost. 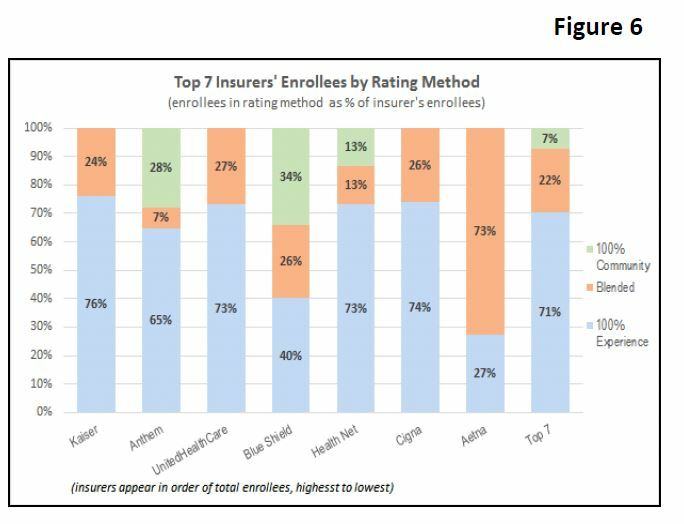 Premiums by product type and rating method: The product type with the highest average premium was Point of Service (POS) ($504 PMPM) and the lowest average premium was Exclusive Provider Organizations (EPO) ($272 PMPM), excluding consideration of indemnity and “other” products, which had very few enrollees (289 enrollees total). Only 3% of all enrollees are in EPO or POS plans. POS and EPO plans combine features of an HMO and a PPO. POS plans typically let enrollees use out-of-network providers, but require referrals to see specialists. EPO plans typically offer a narrowed network of providers, but do not require referrals. Experience-rating refers to the practice of charging customers premiums based on their own past history (“experience”) of health care costs. In experience-rating, groups with lower health risk are typically charged less than higher risk groups, all else being equal. In community-rating, a set of groups is charged the same premium without any variation for differences (such as age or health status) in each group’s characteristics. However, the SB 546 filings demonstrate that paying the same rate (i.e., community rating) does not necessarily mean paying a lower rate in comparison with the large group market averages or the average for experience-rated groups. 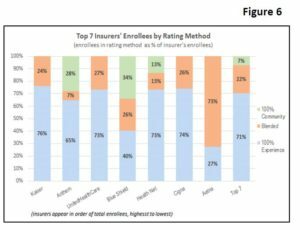 Insurers decide which rating method they will use for their large group customers. Filers did not explain, nor were they required to explain, why the average premiums differed. Based on the filings, it is not possible to conclude whether the mix of groups that are community-rated have higher health risk than those that are experience-rated, whether they chose plans with higher actuarial value, or whether the insurers used another metric to develop community-rating prices that were, on average, higher than experience-rating. Cost drivers: Prescription drugs represent the fastest-growing category of spending by insurers. 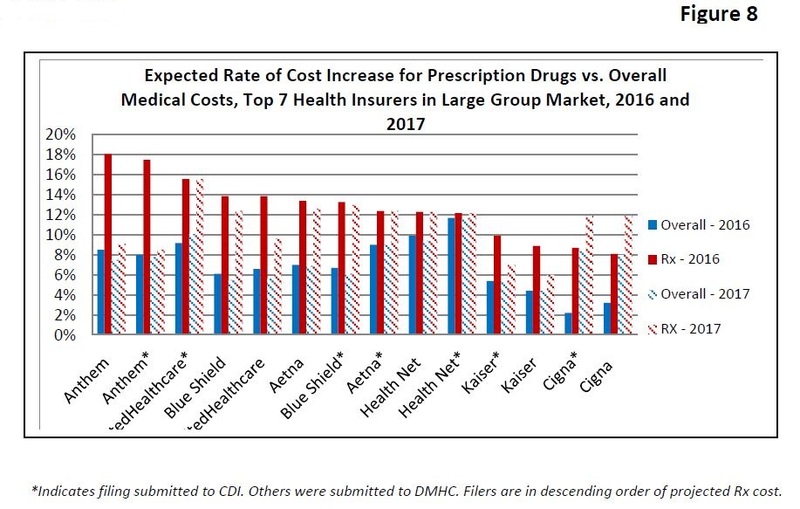 All 14 filings submitted by the Top 7 companies in the large group market reported prescription drug costs were expected to rise at a greater rate than overall medical costs in 2016 (see Figure 8). While overall costs were expected to increase between 2.2% and 11.7%, prescription drug cost increases were projected to range from between 8.1% and 18.1%. 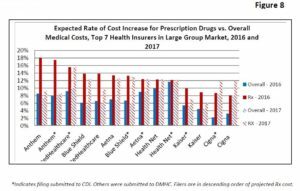 Again in 2017, all 14 filings submitted by the Top 7 companies projected greater cost increases for prescription drugs (ranging from 6% to 15.6%) than for overall medical costs (which ranged from 4.4% to 11.7%). Highest total spending by medical category: Nine of the 11 filings submitted by the top insurers reported aggregate spending to be greatest for hospital services – inpatient, outpatient and capitated (institutional) combined. Apples to apples comparisons of spending on different medical benefit categories by insurers and HMOs are not entirely possible because different companies filled out the SB 546 filings differently. For example, some filers reported spending in just the two categories “Hospital Inpatient” and “Hospital Outpatient.” However, others also included spending for “Capitation (Institutional),” which also represents hospital services costs. In these cases, it’s not clear how much of the capitated spending refers to inpatient versus outpatient services. Five of these 11 filings reported that the benefit category on which they had spent the most was hospital inpatient services specifically. Notably, Kaiser, which represents about half the covered lives in the state’s large group market, did not break spending detail down according to the various benefit categories listed in the SB 546 form (e.g., hospital inpatient, hospital outpatient, physician services, and seven other categories). Because Kaiser’s physicians and hospitals are part of two distinct organizations, Kaiser’s failure to differentiate between hospital and physician spending is baffling. 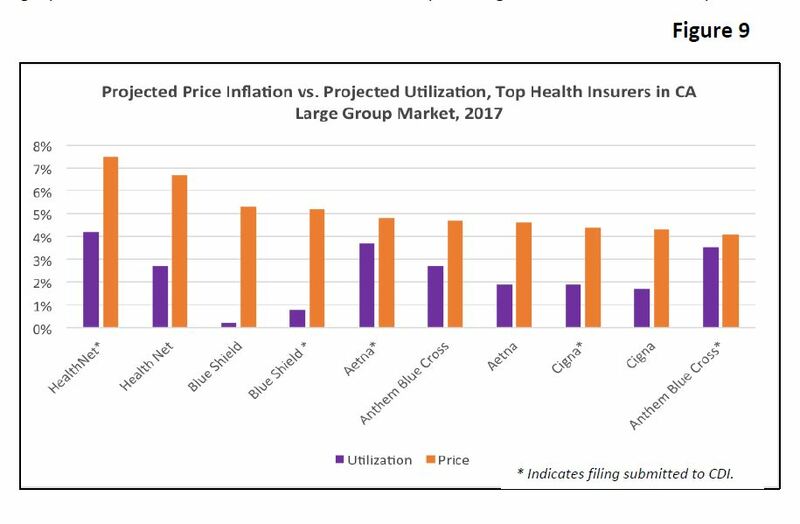 Price inflation greater than utilization: Of the ten relevant filings submitted by the top HMO and health insurance companies in California’s large group market, all revealed that projected price inflation would have a greater effect than utilization on the increasing cost of medical services in 2017 (see Figure 9). 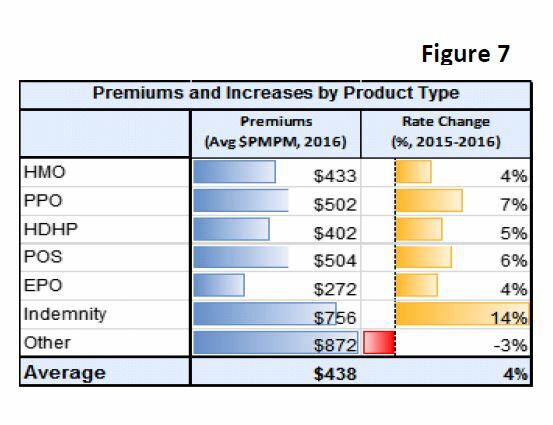 Insurance premium pricing: Given that SB 546 does not provide for a prospective rate review process, filers were not required to disclose their base rates, but rather only asked to briefly describe the factors affecting the base rate and the actuarial basis and to note changes in the use of the factors, and the number of enrollee-months affected. Filers noted whether a particular rating factor was used (the SB 546 form includes geographic region, age, industry and eight other factors), but did not provide the base rate or how it was developed, nor did they quantify how much a group would be charged for having certain characteristics. Commonly used factors that filers acknowledged using were: age and gender, geographic area, health status, industry, family tiers, covered benefits beyond basic health services, cost-sharing, rating method, and provider network. Employee share of premiums and occupation were generally not used. Only one filer reported a range and an average for its use of age, geographic, region, and industry (but not the numeric factor for each rating band), and the tiers and factors used for family composition. Further disclosure from filers is needed to evaluate the appropriateness of their use of industry and gender in insurance pricing. For example, six of the top seven filers reported using industry as a factor, but none stated which industries were charged more or by how much. One filer wrote, “these factors recognize that some industries tend to experience higher claim levels due to greater risk of accident or due to riskier lifestyles of typical industry employees.” Without more information about how the rate was developed, we cannot assess whether this filer’s pricing for industry captures an independent effect that was not already accounted for in health status, or another factor, or workers’ compensation costs. Five of the top seven filers reported age and gender affected their pricing. Without disclosure of the numeric factor and the data on which it was based, we cannot evaluate whether the differences groups are charged for age and gender are based on objective, valid, and up-to-date information. Without a full set of all the numeric factors used, we cannot evaluate the amount of variation in the premiums that is not attributable to an identifiable factor, and may have resulted from the variations in negotiations or at the discretion of the insurer or its sales agents. Moreover, our reading of the California law (Health & Safety Code 1365.5(b)) is that rating based on gender is not allowed. We have contacted the DMHC and are awaiting further guidance. 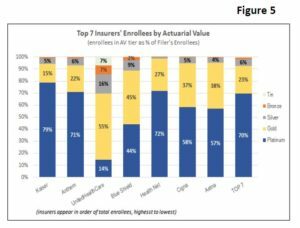 The first year of rate filings reviewed in this document provide a new level of detail about large group, fully-insured health insurance products, which was previously unavailable from any one source. A prospective rate review process with an active State role would not only fill in the many gaps that reporting summary statistics leave in our understanding of how insurance rates were set, but also create the opportunity to prevent unreasonable rates from taking effect and to hold insurers accountable for their price negotiations with providers and pharmacy benefit managers (PBMs). The filings demonstrate the need for greater action regarding prescription drug prices, which are the fastest growing category of projected spending by California insurers and HMOs in the large group market. Last year, the legislature had the opportunity to enact a prescription drug transparency measure, SB 1010 (Hernandez), but, in the words of the Sacramento Bee’s editorial board, “amid a lobbying blitz that was breathtaking by even California standards, 33 trade groups and drug companies from Allergan to Vertex descended to bury SB 1010, which made just enough sense to become a national model.” This year, the Legislature has the opportunity to reconsider this policy in the form of SB 17 (Hernandez). 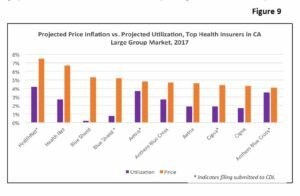 Ultimately, the filings suggest the need to strongly consider significant legislative and/or regulatory action to address hospital prices, which represent the greatest dollar amount of medical spending in the large group market. Maryland has set hospital prices since the 1970s, and the state has “by far the lowest hospital price markups in the country.” Otherwise, as the first round of filings pursuant to SB 546 suggest, we will continue to flounder in our attempts to bring down health care spending. This report is a collaboration of the California Works Foundation, UNITE HERE and SEIU 1021 research staff. Click here to download a PDF of the Executive Summary findings, complete with sources for content.